This is more of a review of the new GW paints than it is about the Novamarine terminator there. He was the guinea pig for my painting experiment. That being said, here's the new test model compared to the first test one. The new one has been painted with all the new GW paints and the old one was painted with the previous paint line. They aren't too far apart really. Now I did make some changes to the new one. 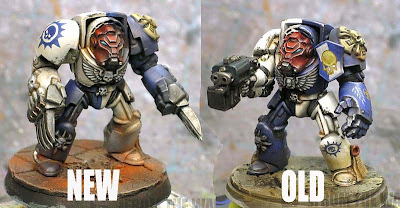 Mainly the armour went from white to bone and the base went to the dark red/black look instead of the natural stone look. For as silly as is sounds, I simply went out and using GW's conversion chart, bought all the replacement colors I would need from my FLGS (Game Vault). Most of them that is. I did make some minor changes I'll talk about in a minute. I ended up buying around 13 paints for this army. The other colors are from other ranges that I will continue to use as I don't think they are getting changed anytime soon. I have not tried any of the new metallics, drybrushing or textured paints and I have no intention of doing so. I've gone to P3 for my metals after reading from a few folks that the new GW metals aren't as smooth as the previous line and drybrushing is something I can do with any color. As far as textured paint, if I want texture, I'll add it to the color I want instead of trying to make one of those colors work. To be honest, I can't tell the difference without looking at the pot of paint. Not that it really matters to me, I buy colors based on the color and not the range (base, layer, etc.) they come from. The new colors seem to be a bit less opaque and slightly more transparent overall. I'm okay with that too. While it means I have to do two thin coats most of the time instead of one, my blending will be made slightly easier overall. I will be moving towards using a light grey primer for almost all of my work now. With the new transparency in most of the paints, I find that the light grey helps with getting a smooth finish easier than white or black does. Again, no big deal. The second part of that is I'm going to work on not being so messy when I paint. I'm going to try and control my brush work a little more so I have less clean-up to do as I go along. If I can keep my paint on the elements I'm working on at the time and avoid those stray marks, I can keep my basecoats nice and smooth. I like the new shades. They seem to flow onto the model a bit smoother than the previous ones did. Maybe I just think they do and it's really just the same. I have noticed the colors are a bit brighter though. The new "Devlan Mud" or Agrax Earthshade as it's known is now a bit purer in color. It's not as muddy or muted of a brown as its predecessor was. The new black (Nuln Oil) is much darker too. It seems to be the equivalent of two passes with the old Badab Black. Again, neither of these issues are earth shattering, just some fine tuning to get used to with the new line. I am making a point though to include some washes from other lines. 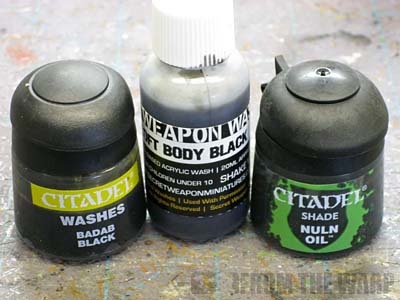 Like the Soft Body Black I use from Secret Weapon minis. With the new shades filling in for the old GW washes, I still like having other lines with their unique characteristics for specific purposes. I suspect as I continue to paint and try new things, I'll pick up other washes from other lines as well. What used to be a reliance on just GW washes has opened up to other companies where I think they do it better. I know, I haven't even given them a try before moving on. If someone out there wants to send me some of the new metals, I'll gladly try them out. Otherwise, I'm not wasting my money after hearing from more than one person they aren't as good. I have yet to hear anyone have a bad thing to say about the P3 paints so I jumped ship just like that. After painting my new model using the P3 metal (Cold Steel), I have to say I had no issues with it at all. I already use P3 Blighted Gold, so this is just an expansion in that department. I may even try and branch out to other kinds of metals to see what additional effects I can achieve instead of relying on the old standby of "paint it metal and wash it black." All in all, I like the new range. The increase in transparency is not a big hurdle to overcome. I can see how some colors not mathcing up is going to cause some real problems for folks. I really liked the old Charadon Granite and it's new version is a bit lighter. It doesn't give me the same effect I used to use the old color for. I'll need to hunt around for something to replace it. But that's one color so far. Maybe I'll find another one or two like that. If that's as bad as it is, I'm not going to sweat it. The new color for Mechrite Red (Mephiston Red) didn't give me any issues when it came to painting my Sergeant's helmet. I was worried about that when I was comparing the new and the old colors when I bought them. I think the folks who are going to have the most trouble are those who have used one color on a model and did not add any washes or highlights over that. It's simply one color on the model. Finding an exact match may prove problematic for those folks in some cases. If you're one of those painters who uses a base color, a wash or two and then a highlight or two... you shouldn't have any real issues making the new colors work for you. I think the biggest thing will be learning the subtleties of the new paints. Opacity and transparency, a slightly brighter or duller shade of a color... and so on. The new paints are here to stay. I've heard of lots of folks who have attempted to buy up the colors they need form the old range while they still could, but you're not doing yourself any favors. You're only prolonging the inevitable. When it comes to the new paints, do yourself a favor, buy a couple of them (enough to try and reproduce your current color scheme) and practice. I bet you're surprised at how easy it is to do if you keep an open mind and you look for solutions instead of problems. And finally, a few more beauty shots of the new terminator. One last note, the model has been weathered with powders and such so you're looking at the new paints with the effects of the weathering over them. Good write up! I was a little worried at first though my early experiences have been generally positive. The loss of Necron Abyss is a pretty big one for me as a Crimson Fists painter, the replacement Kantor Blue is considerably lighter. I have some experimenting with colours ahead of me! That's a sweet looking Marine. I really like the quartering. Interesting review you've written. I am tempted to buy the new shades and glazes, since for base colours I use Vallejo exclusively... even though I find the idea of foundation paint enticing as well. I suppose some experimentation is in order. Both are great! But I must say: "Newer one is cooler one!" Think the weathering has really improved the look and feel of the model. The new base steel colour from GW is pretty good for what I've done with it so far, i.e. a replacement for Boltgun Metal. Nice solid coat, accepts Badab Black reasonably well. 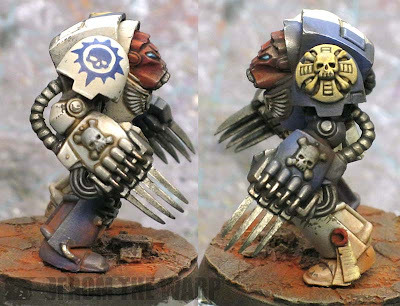 I'm also a big fan of P3 Blighted Gold - it definitely filled a gap in the previous GW paint range. P3 paints in general have been a pleasure to use. Chris: I know what you mean. I think most of us have that one color or two that is our go to color. It's just going to take some experimenting to find something that works in its place now. Marcin: The old Foundations seemed to do what they said they would. They covered nicely in one pass as a very opaque color. The new "bases" don't seem to have that same quality. Like I mentioned, I could tell the difference between them and other paints without looking at the pots. Taanekh: Thanks, I think the bone armour is what does it. Andy: Interesting... thanks for the comment. You say it's a pretty good replacement... would you recommend it though or would you say P3 is a more solid choice overall? Thanks for the review Ron. 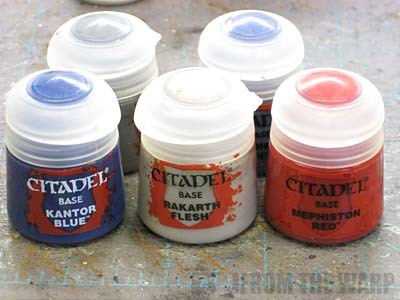 Agree about the new bases - they are much more like the regular paints. But the Mephiston Red is really red. I've not looked at P3 but I've found the GW and Vallejo reds are either pinksh or orangish. This one seems to sit right on true red. One question: have you found a replacement for the Charadon granite already? It is very important for me because I paint my Templars armour using mostly this color, you see. When you buy them, make sure they are the black labelled ones shown above! The original (white labelled) ones were absolutely rubbish. Very gunky and I found them almost impossible to use. The new ones, however, I hear are possibly the best metallic miniature paints on the market (I bought a couple last week to try them out). 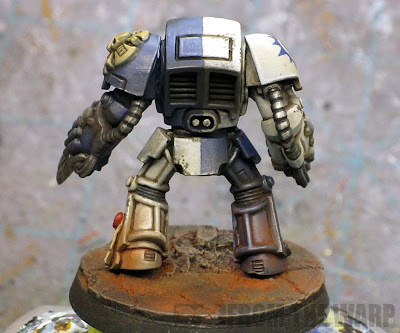 this is a very odd co-incidence, because i decided to do a quartered blue and white scheme for my own customchapter yesterday evening and was wondering how to go about it. any chance of a list of the paints you actually used or even a step by step for this guy? he looks exactly like i envisioned my own to be, even down to the base colour! You should try the dry paint it is actually kinda cool. It is pigment heavy and light in the binder so it is powdery on the brush makes for a little bit cleaner drybrush,if you know what I'm saying. I have like 6 pots of each,a few extra of the granite as it is the primary way I do black. But in general the quality is the same,more colors is a good thing. I am just slowly buying a few here and there until I get all the ones I do not have and replaceing old ones with the new equivilant. It has become hell on my paint caddy these days though,gonna need a second one. Avicenna, thanks for the pointer. I've used the old P3 metals before and they were absolutely terrible-- I was quite confused when Ron wrote they were considered "good". I'll have to check out the new P3 metallics. Personally, I see the new paint line as an excuse to finally move to vallejo paints. I have wanted them for quite some time but could not justify the move considering I have so many GW paints. @Baalzamon - I was looking into getting some VMC German Grey for my black army and it was said that it is close to Charadon granite in color. Gorman: Very true, it is a "pure" red in that sense. Baalzamon: Not yet, but then again I haven't really gone out looking that hard yet either. Avicenna: Thanks for the tip! I would not have known that. Will Wright: You're only prolonging the inevitable. One day you'll need more Charadon Granite and you'll be all out. I need to find a suitable replacement color for that paint myself. PalinMoonstride: I thought about moving to P3 paints with this new line, but found the selection of colors somewhat limiting. And I absolutely hate to have to mix colors. If Vallejo is right for you, I'd say to make the leap and don't look back. I know I'm much happier using the materials (paints and such) I want to when working than having to use materials I don't want to. I'm still forming an opinion of the new paints. I've completed my Ironclad dreadnought using all of the new blues and thus far all I can say is "they're certainly different". Kind of a general statement I know, but that's how I mean it. The end result was really nice, but doesn't match any of my other models. A lot of reviews are saying that the new 'shades' flow better than the old 'washes'. My experience with the blue shade (only one I've tried) has been rather poor. It didn't flow at all, just sat on the surface. I even tried to push it into the recess and all it managed to do was streak. Maybe my pot is bad, I just don't know. In regards to the metallics... The new silver line isn't nearly as good. However, the golds and the brass ranges are much better than previous ranges, and they don't seem to have the problem that the p3 line does with settling (this is something the original gw paints did when coat d'arms did their paint as well). I snagged a couple of the drybrushing paints, and they'll be great for terrain or batch painting, but I can't see using them day in, day out. The textured paint seems to have limited uses, and I will likely continue to base my minis the way I always have: with texture applied and then painted. Ron, as far as I can tell it's pretty similar to Boltgun Metal, but does cover a little better. 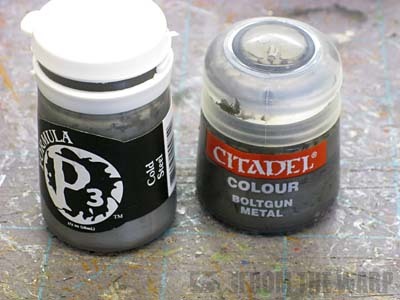 I've only used Blighted Gold from the P3 Metallics, but based on that I think the new GW base gives a more solid coat - not used a silver metallic form P3 yet, so can't really give a fair comparison. As for a Charadon Granite replacement, I haven't seen one yet - VMC German Grey definitely does not match, and the new GW Stormvermin Fur is too light (although is a little closer to the colour). Charadon Granite seems a more browny-green colour, so maybe a mix of P3 Cryx Base and the new GW Dryad Bark might get close to it. As much as I hate to say it, as I use Charadon Granite A LOT, we're going to have to go down a different route. It's not a bad thing as Charadon Granite can sometimes be a bit of a cure-all (it works as a base for green, brown, grey and black). It will push us to experiment, try new colours and techniques, and think a bit more about what we do - that's definitely a good thing. oni: Interesting, I've used a handful of them know and find them all to flow rather smooth. Anon: You say the golds and brasses are usable then? Hmmm... might be worth looking into. Will Wright: Absolutely. If I can find a match, I'll post it here for sure. Andy: I used to use for lots of things too. The new color works alright if you wash it with the Agrax Earthshade but even then it's a bit light. I'm going to look around this week to see what I can find. -Warplock Bronze, Runelord Brass, then add in Mithril Silver to the mix to highlight. Then a quick wash with Devlan Mud. I use VMC Black Grey as a replacement for Charadon Granite. It doesn't have the slight brown tint to it, but it's a warmer color than black. Wienas I just played with it if you add the smallest dot of schorched brown or its eqvelant it is a dead ringer. I've bought some of the new paints, and so far I'm most impressed with Wild Rider Red as it works as a really good highlight for Blood Red...almost florescent. Before that the only solution seemed to be either Fiery Orange or Vomit Brown. In addition, the new purples seem nice as well, as we had no real highlight or very dark (but saturated) purple to speak of in the GW range (without mixing). I've been using the drys a lot as I seem to not have the right technique to get a good drybrush on, even after all these years. Any chalkiness with the drys can now be fixed pretty easily with the glazes: they definitely do act differently than the washes, as the color is much lighter in value while staying highly saturated--much like the inks of old use to behave. @Anon: How does Warplock Bronze compare to Tin Bitz? Do you know how Runelord Brass compares to Sycorax Bronze? I was confused by the two as the colors seemed so similar at the store, so I only bought Sycorax. I have used the Sycorax Bronze as a highlight for brass/bronze/orangeish metals and it seems to work well, certainly better than in the past having to mix Dwarf Bronze and Mithril (usually looked too grey). I'll weigh in with Oni. The new washes produce smooth overall coverage, which is great if the goal is the heavily tint washed areas. I now keep a wet brush nearby to remove wash from raised areas so the colors don't change as much. I think the new gold is an improvement as well if you were using the older GW gold paints. I was using Old Gold. Personally I can't stand the new silver metallic line. Everything looks grainy to me. Now, to the topic at hand. I really like the improvements in the second test mini. De-saturating the blue on the newer model really helps. The first mini's power fist was a little vibrant. I think the new red basing is outstanding as well. The warm red really contrasts with the blue and white. This is going to be a really dramatic looking force! Joe: I may have to try the bronzes then if folks are saying those aren't too bad. Wienas: VMC Black Grey you say... hmmm. Will Wright: But that's the very thing I am trying to avoid. I don't want to have to mix colors. I despise having to do that. Dain Q. Gore: There's something I have not experimented with yet, the new glazes. Drathmere: Thanks. I think the use of the new paints helped with de-saturating the colors. I didn't really try to, but the model just sort of came out that way. I've tried a couple of the new GW metallics, and I think they work ok. I worked out aa recipe for bronze based on your own recipe (for painting Minotaurs): Warplock Bronze, Coelia Greenshade wash, drybrush Warplock Bronze, drybrush Hashut Copper. These were the closest I could find to your original recipe. I think it turned out ok (though the Coelia Greenshade wash was a little light). But I'm a new painter and started with the new paints, so I can't compare them to the old paints. Clif: I'm putting together the Novamarine tutorial now. As for the bone on this guy, it's a duplicate of the technique I use to paint Deathwing. And... the best part is the new GW color Rakarth Flesh works perfectly in place of Dheneb Stone. Great review Ron! I'm still refining my 'painting white' techniques and am leaning heavily on your tutorials. Thanks for the review. It was helpful. I think I will stack up on some of the colours I use the most, the foundation flesh and yellow, and I think I will try out the new Mephiston Red. As regards metals, you are right. There are many brands that produce better quality metallics. Damn your termies are good looking, big improvement on the weathering too! 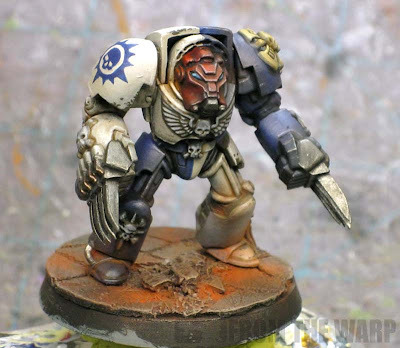 Very nice Novamarine Terminator and great article, so thank you! I have got a quick question though: do P3 only sell their paints in sets or can you buy individual pots anywhere? Mordian7th: I haven't used much of the Army Painter line. I hear good things about their stuff though. I noticed the Agrax Earthshade is a bit "purer" but not so much that it's bad... at least for what I do with it. Night Runner: Stocking up on the old stuff only prolongs the inevitable. You'd do better to look at what's out there now and see what you can do with the new colors. Maybe another line has what you're looking for? Ludovic V. : Thanks! And I buy my P3 colors as individual pots from my FLGS. I don't know if they sell them in sets or not, but you should be able to get them just like GW paints... individual ones right off the rack. Excellent article again and very helpful with this time of "transition". My own challenges are for greys. I'm preparing for a Space Wolves army commission and I wasn't that impressed with Dawnstone. It was thinner as you pointed out and maybe I'm just going to have to get used to doing two coats to get the even coverage, that wasn't always necessary before. I got Ghenna Gold as a replacement for Shining Gold as one of my projects is a Custodes army (C:GK). The GG has more red in it than SG, so it won't match up exactly, but it appears to be close enough if you are not painting the two colors right next to each other. I really like the weathering effect you used, so any expansion of how you did that would be greatly appreciated.